Norwich City will face East Anglian rivals Ipswich Town in the play-off semi-finals after beating Fulham to finish third in the Championship. 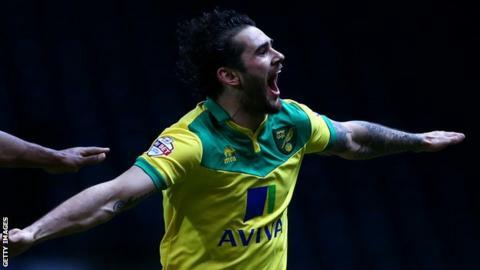 Bradley Johnson's brace and goals from Nathan Redmond and Graham Dorrans earned victory for the Canaries. Fulham added late consolations through Matt Smith's volley and Johnson, who headed the ball into his own net. Norwich will go in to the Championship play-offs having lost just once in their last 11 games home and away. Alex Neil's side finished the season four points short of earning automatic promotion, despite dropping just eight points from their final 18 games. They have never faced Ipswich in the play-offs before, but have done the double over their rivals this term. The Canaries will travel to Portman Road on Saturday, 9 May, with the return leg at Carrow Road on Saturday, 16 May. Norwich took the lead when Johnson tucked away Gary Hooper's cut-back before Redmond fired in from the left corner of the box before half-time. Hugo Rodallega had chances either side of the break for the visitors, but Dorrans finished from Redmond's lay-off to make it 3-0. Fulham almost pulled a goal back 15 minutes from time when Shaun Hutchinson's goal-bound effort was blocked by Gary O'Neil. And, after Smith had volleyed home for Fulham, Johnson fired in City's fourth from 25 yards to take his tally to 15 for the season. Johnson headed into his own net for an injury-time consolation for the visitors, who suffered a first loss in six games in an encouraging end to the campaign. Norwich manager Alex Neil: "First and foremost it's good to go into the play-offs with a bit of momentum behind us. We won the game, scored four goals and hopefully the win will give the players a little boost. "I should imagine it will be biggest derby ever in terms of what is at stake. It's a huge game, the sort of game you want to be involved in as a manager or a player. "I know how much it will mean to everyone connected with the club - and we will be doing our utmost to make sure we come through it." Fulham manager Kit Symons: "It has been a tough season, tough for everyone - the management, the players and the fans. "But that makes me all the more determined to bring good times back to the club. "I am confident we can push on - and the hard work starts now. If I do get a quick break away with the family I'm sure I will be spending a lot of time on the phone. "There will be changes - and there needs to be for the good of the club." Match ends, Norwich City 4, Fulham 2. Second Half ends, Norwich City 4, Fulham 2. Own Goal by Bradley Johnson, Norwich City. Norwich City 4, Fulham 2. Foul by Elliott Bennett (Norwich City). Matt Smith (Fulham) wins a free kick in the attacking half. Goal! Norwich City 4, Fulham 1. Bradley Johnson (Norwich City) left footed shot from outside the box to the bottom right corner. Assisted by Nathan Redmond following a set piece situation. Danny Guthrie (Fulham) is shown the yellow card for a bad foul. Graham Dorrans (Norwich City) wins a free kick in the attacking half. Attempt blocked. Vadis Odjidja-Ofoe (Norwich City) right footed shot from outside the box is blocked. Assisted by Nathan Redmond. Attempt blocked. Patrick Roberts (Fulham) left footed shot from the right side of the box is blocked. Assisted by Danny Guthrie. Substitution, Norwich City. Ryan Bennett replaces Sebastien Bassong. Goal! Norwich City 3, Fulham 1. Matt Smith (Fulham) left footed shot from outside the box to the bottom left corner. Goal! Norwich City 3, Fulham 0. Graham Dorrans (Norwich City) right footed shot from very close range to the high centre of the goal. Assisted by Nathan Redmond. Attempt saved. Vadis Odjidja-Ofoe (Norwich City) right footed shot from a difficult angle on the right is saved in the bottom right corner. Assisted by Nathan Redmond with a through ball. Attempt missed. Bradley Johnson (Norwich City) right footed shot from outside the box is too high. Assisted by Vadis Odjidja-Ofoe. Attempt blocked. Gary Hooper (Norwich City) right footed shot from the centre of the box is blocked. Assisted by Elliott Bennett. Attempt saved. Matt Smith (Fulham) right footed shot from a difficult angle on the right is saved in the bottom right corner. Assisted by Ryan Tunnicliffe. Attempt blocked. Shaun Hutchinson (Fulham) left footed shot from the centre of the box is blocked. Martin Olsson (Norwich City) is shown the yellow card for a bad foul. Patrick Roberts (Fulham) wins a free kick on the right wing. Attempt missed. Vadis Odjidja-Ofoe (Norwich City) left footed shot from outside the box is too high. Assisted by Gary O'Neil following a corner. Corner, Norwich City. Conceded by Danny Guthrie. Attempt blocked. Bradley Johnson (Norwich City) left footed shot from outside the box is blocked. Assisted by Gary Hooper. Attempt saved. Gary O'Neil (Norwich City) right footed shot from outside the box is saved in the centre of the goal. Vadis Odjidja-Ofoe (Norwich City) wins a free kick in the attacking half. Attempt blocked. Bradley Johnson (Norwich City) left footed shot from outside the box is blocked. Assisted by Vadis Odjidja-Ofoe. Substitution, Fulham. Patrick Roberts replaces Sean Kavanagh. Substitution, Fulham. Matt Smith replaces Hugo Rodallega. Substitution, Norwich City. Vadis Odjidja-Ofoe replaces Wes Hoolahan. Substitution, Norwich City. Graham Dorrans replaces Jonny Howson. Attempt missed. Jonny Howson (Norwich City) right footed shot from outside the box is high and wide to the right. Assisted by Gary O'Neil. Attempt saved. Nathan Redmond (Norwich City) left footed shot from outside the box is saved in the centre of the goal. Assisted by Bradley Johnson. Ashley Richards (Fulham) wins a free kick in the defensive half.